This year's Wayland Invitational was the most fun I've had with the Roadster since it arrived. Not only was the event a blast, I really enjoyed the drives down and back. Be sure to check out our gallery of photos from the trip and drag racing. Cathy and I started with a charge-scouting drive to Cannon Beach, Oregon. We stopped for lunch at the Artic RV Park and Tavern along highway 101 in Artic, Washington, a bit over halfway from Seattle to Cannon Beach. Cathy called ahead to confirm that the tavern would be open for lunch and ask about charging. When she explained that we wanted to plug in to charge our electric car while eating, the owner, Roy, responded enthusiastically and encouraged us to stop by. Forty minutes later, we pulled into the parking lot and he was outside greeting us before we'd made it into a parking spot. He led us to a NEMA 14-50 outlet and we had a nice chat while plugging in. We asked what he charged for the hook-up and he said we'd already paid for the electricity in information. 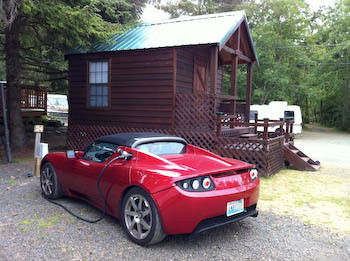 Charging next to a cabin at the Sea Ranch RV Park. We drove 207 miles that first day, mostly on tree-lined state highways with very little traffic, a very pleasant drive in cool, overcast weather. We spent an hour charging over lunch and another 45 minutes while unpacking and getting settled into the cabin. We got back from dinner at JP's and an excellent play at Coaster Theatre to plug in for the night around 10 pm. The car was fully charged before 5 am the next morning. We never had to "wait" for a charge, it just happened while we were doing something else. I don't miss gas stations at all. Friday morning, we stopped by Cannon Beach City Hall to chat with Mark See, the public works director. They are planning to include infrastructure for EV charging in an upcoming public parking lot remodel, but don't have specific plans for chargers yet. I'll follow up and try to help them avoid the usual rookie mistakes. We took state highway 26 to Portland, another great road winding through forest, this time in sunny weather. There was more traffic, but frequent passing lanes so we could pass or be passed as needed. We were motivated to preserve charge for the drag races that night, but there's a limit to how restrained I can be when I have plenty of charge to reach the destination and I'm driving behind a slow, ugly truck. Charging in range mode is great, but I'm a fan of switching back into standard mode for driving. Even when I'm driving for range/efficiency, I want access to the Roadster's acceleration when I need to pass a slower vehicle going up hill. Crazyhorse Pinto, Karmann Electric, and White Zombie. There were a bunch of EV drag racing legends at the event trying out newly revised vehicles. John Wayland and the White Zombie team had a new Dow Kokam Lithium Ion battery pack, Father Time had a new dragster with 2 gigantic motors (one for each rear wheel, wired in series), Mike Willmon was there with Crazyhorse Pinto, Dave Cloud had his electric rail dragster. Some new cars there included Jay Donnaway in his Karmann Electric and Stephen Johnsen in his electric Fiero. White Zombie fried their ailing dual 8-inch motors Friday, so the team worked around the clock to get new dual 9-inch motors installed. They got it done and put in some test runs Saturday night. There were some issues that prevented them from breaking their 1/4 mile record, but they blew away their 1/8 mile best with a high-six time. Their Zilla controller was shutting down, but even coasting for the second half, they put in a Roadster-roasting 11.774 1/4 mile ET at 100.80 mph. When they get the bugs worked out, Zombie is going to set some records. John was giddy with the power of the LiIon pack, estimating 0-60 time at around 2.4 seconds and gloating about being able to drive home after three heavy track runs and no charging. Crazyhorse Pinto had some wild wheel-popping starts (some suspension adjustments are needed to get rid of the bounce) and his times were dropping down but the track did a poor job of scheduling the EVs on Saturday, limiting Mike (and the rest of us) to just a few runs each after they hit the noise curfew at 10 pm and kicked nearly all of the gas-burners off of the track. Jay and Stephen had a number of good runs, but I don't recall the times. They both seemed pretty happy with getting their cars on the track. Father Time had controller issues that kept him off the track despite several nights with only 4 hours of sleep getting ready. We're all pulling for him to get it on the track soon. Last year, Richard didn't take delivery of his Roadster until just after the Wayland Invitational, so we drove down together and took turns driving my Roadster. This year, Richard was excited to drive his car and I was anxious to see how my car performed compared to last year, being a year older and having just passed the 10,000 mile mark on the drive down to Cannon Beach. On Friday, Richard and I did eight runs each, all very consistent, me in the 13.2's and Richard in the 13.1's. I started around 65% charge in performance mode that night, better than Friday night last year. I was practicing the two-foot launch and trying to get decent reaction times. Tom and Rich going head-to-head. On Saturday, I was only able to get in four runs because of the track scheduling issues, all were head-to- head against Richard. My first run was a 13.3, but on the second run I got a good launch (0.187 sec RT) and took the lead. Hurtling down the track, Richard started to gain (and beat my 1/8 mile ET), but then I pulled ahead breaking into the 12's: 12.978 1/4 mile ET at 103.40 mph, actually edging out Richard for the "win." After the launch, there's isn't any great skill in keeping the Roadster in its lane and the accelerator pedal on the floor, but it was still pretty exciting to go neck-and-neck down the track at Roadster speeds. On the next run, Richard restored things to their normal order, pulling a 12.968 1/4 ET at 103.27 mph compared to my 13.007/103.40. We were both quite pleased to break into the 12s, and I was especially thrilled to beat my best time from last year (12.982 1/4 mile ET at 103.48 mph) after a year and over 8,000 additional miles on the pack. To be fair, last year I was driving with traction control on and was pretty clumsy with the two-footed start, so I should have beat my time from last year by more than 0.004 seconds if all else were equal. There are many factors that affect performance (state of charge, battery pack temperature, tire pressure and tread, air temperature, humidity, track surface conditions, etc. ), but whatever I've lost in my battery pack's power capacity is within the range of environmental conditions and variation in my limited driving skill. It seems to me that just about everyone in the EV drag racing community is in this to demonstrate that EVs can be fun, exciting cars. In fact, I read about John Wayland and White Zombie before I'd even heard about Tesla Motors. Knowing that John and the rest of the NEDRA community were building electric super cars in their garages added credibility to Tesla's plans. If it weren't for that, I'm not sure I would have had the nerve to put down a deposit on a Roadster so early. The EV drag races are more about engaging the public in a dialog about electric cars through showing the cars than about winning races. Beating gas burners and setting records just quantifies EV progress. At the "Show and Shine" Saturday morning. In addition to the ad-hoc car shows at the track, we gathered for the "Show and Shine" in the Village Inn parking lot Saturday morning. There was a great turnout of vehicles from the drag racing community and the broader EV community. The Waylands also host a gathering at their home, AKA the EV Juice Bar, where everyone collects to socialize, charge up, repair, upgrade, and commiserate. All the big EV experts collect there: Otmar Ebenhoech, Mike Willmon, Dave Cloud, Rich Rudman, Father Time, and others with experience in batteries, motors, controllers, and drag racing mechanics. It's amazing to see what goes on in John's garage, driveway, and yard as this community converges to share stories and expertise. My big contribution to the community was taking Jay Donnaway for a ride in the Roadster so he could buy a fuse at Radio Shack. Cathy took the train back to Seattle Saturday afternoon, so I did the drive back solo. 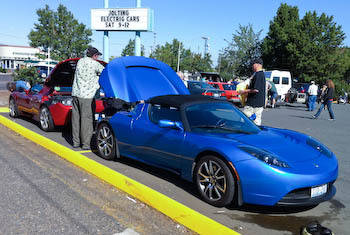 I stopped at the Centralia Burgerville, about halfway between Seattle and Portland, to use the Tesla high-power connector they had installed for Roadster charging. For the first half, I drove a steady 60 mph on cruise control, watching the outside temperature reading on the touchscreen rise steadily from 75 to the mid 80's. I spent about 35 minutes charging at Burgerville while I stretched my legs and enjoyed one of their cold smoothies. When I headed back to the car to field any questions while finishing the smoothie, a family of three had just pulled up. Mom was pointing to the cable plugged into the charge port, explaining the car to her son, "this is an electric car charging its batteries, we should all be driving electric cars." 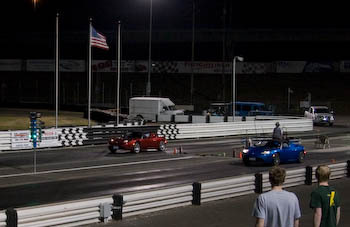 Drag racing is fun, and has real public outreach benefits, but moments like that are why we bought a Roadster. With the little bit of extra charging, I had more than enough charge to finish the last 90 miles no matter how I drove. As the temperature climbed into the 90's, even showing 107 degrees at one point in traffic, I jetted the rest of the way home going 70 mph with the AC on full blast.